Happy Monday! We hope that everyone stayed safe and warm over the weekend. With the first real snow falling in the Atlantic Provinces, our thoughts turn to Christmas and other reasons to get together with friends and family. Why not get the beer-lover on your list something special from your local brewery? We’ve compiled a list of fun and interesting brewery- and beer-related gifts, to make any Cerevisaphile happy on December 25th (or any other day of the year!). 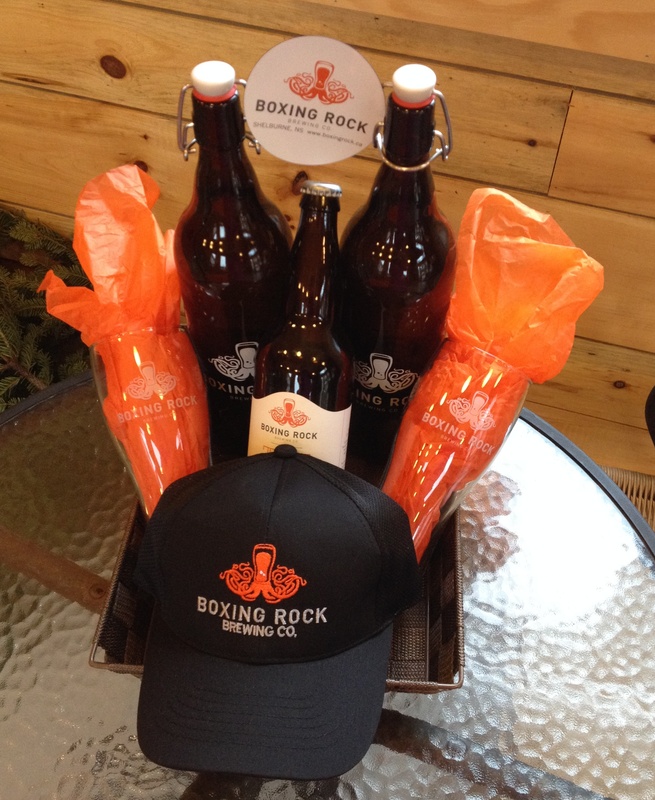 Several breweries in our region are doing up gift baskets, including Boxing Rock in Shelburne, NS. They have several basket examples in the $30-$80 range, but are also happy to tailor them to your exact specifications. Baskets can include 1.89L growlers, 1L growlers, trucker hats, toques, glassware, t-shirts and long sleeve shirts, books, magazines, cards, bottle trays, magnets and keychains/bottle openers. And of course, beer! Their just-released U-889 Russian Imperial Stout is a great beer to sip beside the fire on a chilly winter night. You can contact them via email or phone (902-494-9233 ext 3, ask for store manager Carmen) to order. 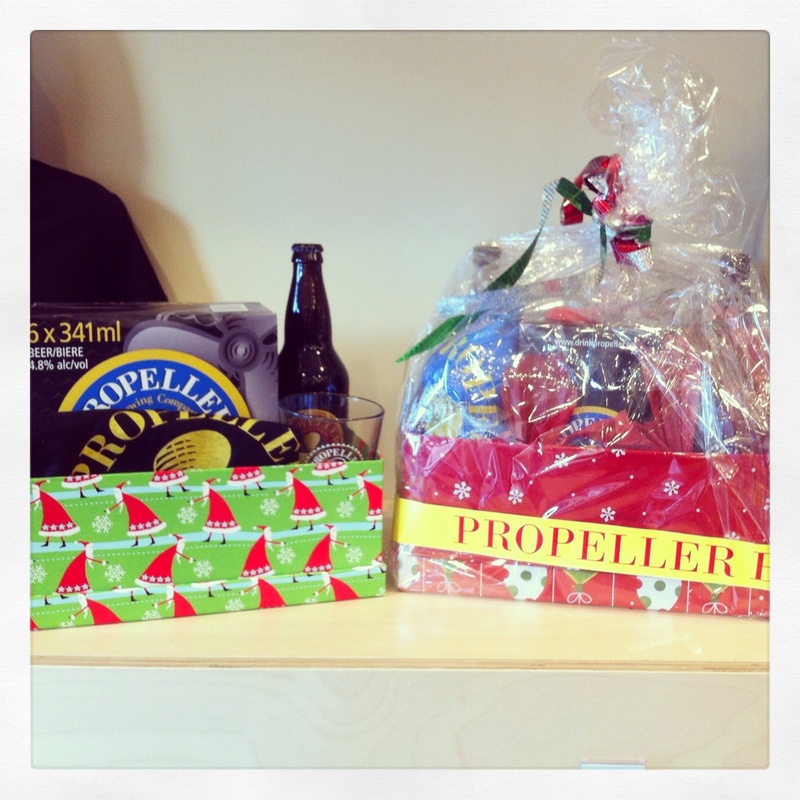 Propeller Brewing in Halifax also has a few gift basket options available. Their $50 Gift Baskets include a sixpack of beer, t-shirt, Two single 650ml or 500ml beer (their Revolution Russian Imperial Stout is a great choice here), 2 bottles of pop (Ginger or Root Beer), two glasses, a bottle opener and 4 pin-back buttons. They are happy to mix and match customer baskets as well, to fit any budget. Drop by their Halifax or Dartmouth locations to check out the options. There is no shortage of breweries selling tshirts and glassware in our region, so why not choose something a bit unique to put under the tree this season? Garrison Brewing in Halifax has several items that certainly fit that bill: they sell everything from soap to tin signs to put up in your home bar. Plus their Spruce Beer is a great way to get Christmas in a bottle! 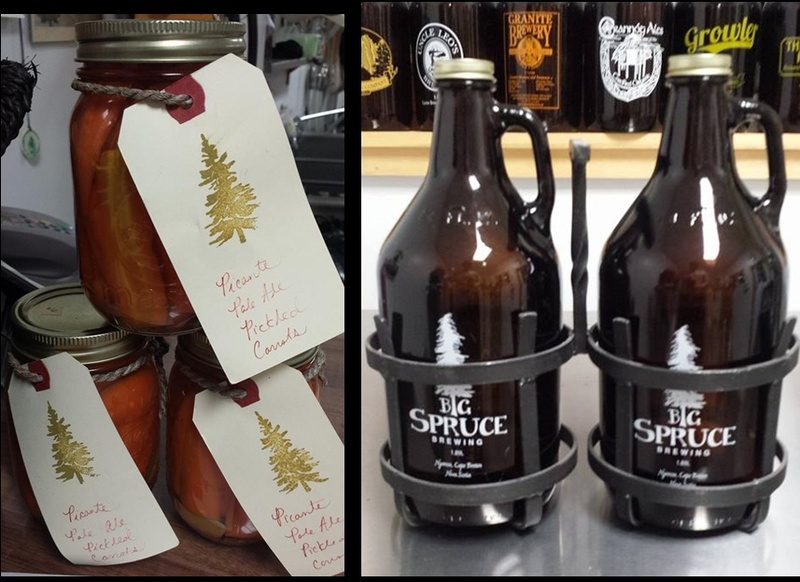 Big Spruce Brewing in Cape Breton also has some great items available: how about a forged steel double-growler holder, spent grain granola, or Picante Kitchen Party Pale Ale Pickled Carrots? Drop by their brewery in Nyanza or the Cape Breton Farmers’ Market every Saturday in Sydney River to grab these and more unique gifts. Another brewery with a variety of gift options is PEI Brewing Company. 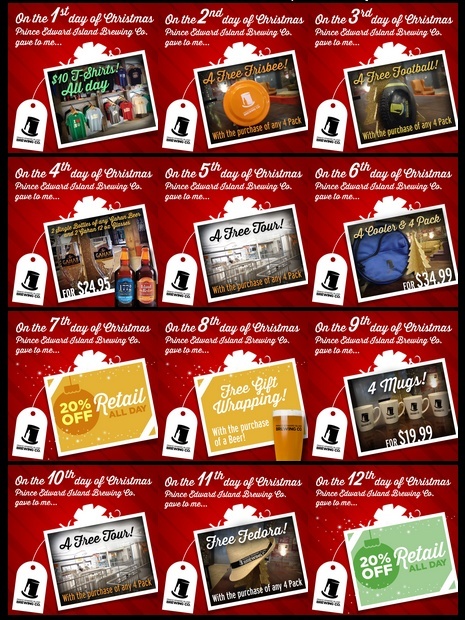 Every day from Dec 10-21st they have been offering up a different free gift or special price on their gift ideas, including coffee mugs and free tours of the brewery. Check out their retail store for more details. And look for their 6.5 % Bock, infused with vanilla bean, bourbon, and oak chips, available soon in growlers at the brewery and Gahan House Pub. You’ve got a basket/stocking full of tshirts, hats and glasses, so what about the beer to go with all of that? Well, your local breweries have you covered as well! As mentioned above, Russian Imperial Stouts are popular this time of year, as well as other darker, more robust beers, or beers using spices not normally chosen in the warmer months. Quidi Vidi brewery outside of St. Johns’s, NL, has brewed up their Winter Ale, a dark rich ale, brewed with coriander, cacao and vanilla. Look for it at the NLC. Paddys Irish Brewpub have released their Frost Biter Winter Warmer, with notes of chocolate and weighing in at 6%. Pick up a growler to share! And Sea Level Brewing will have their High Street Wee Heavy available shortly in cans and growlers. Weighing in at 6.3%, it features a complex malt body and slight smokiness in the finish. Picaroons Brewing in Fredericton is taking it to a whole other level, with their annual 12 Beers of Christmas event. From the 12th to the 23rd of December, they are releasing a new beer daily, only available in growlers at their Queen St Brewtique. Check their Twitter or Facebook pages at noon for the announcement, and be sure to show up promptly at 4pm (or earlier), as they sell out quickly! So far this year they’ve released their Dark & Stormy Night infused with orange and dark chocolate, their Yippee IPA with spruce tips, Timber Hog Stout with vanilla/hazelnut/chocolate coffee beans and their Blonde beer infused with cranberries. Also look for snazzy locally-produced wooden coasters at the Brewtique, great stocking stuffer material! If you are looking for more of an event-based gift, why not choose tickets to some of the upcoming beer events or festivals? Over the next few months, there will be several events worthy of your attention. The Fredericton Craft Beer Festival is taking place at the Fredericton Convention Centre March 8, 2014, and will feature the festival debut of new ciderhouse and breweries in the region (Red Rover and Hammond River). Less than a month later, on April 5th, the Saint John Beer Fest takes place at Harbour Station, and will help to thaw off some winter freeze. A new festival in the Maritime provinces is the Great Canadian Beer Expo, in its first year. It will be visiting Sydney, Halifax, Moncton, Saint John, Fredericton and Charlottetown, with two nights in each city. Tickets for all of these festivals are on sale now! Why not turn your beer-enthused friend or family member onto homebrewing? Getting started is very simple, all you need is a bucket and a kit to make good beer at home. For those looking to do a bit more, Halifax homebrew shop Everwood Ave has everything a new brewer (or seasoned veteran) would need, from grain and hops, to kegging and bottling equipment. For someone who likes to experiment with out-there styles, maybe a one-gallon all-grain kit is the way to go (in case an experiment goes wrong, very little is lost; or for brewers with very limited space)? They will ship anywhere in the region (and beyond), and if you order today it will arrive before the 24th. Home beer and wine makers are both served by Noble Grape, with several locations throughout the HRM, Annapolis Valley and Fredericton, NB, including many that offer onsite winemaking. They also carry the Festa Brew line of wort kits, which is a great way to start onto a path to brewing. The direct them to the Brewnosers forums for great resources from fellow homebrewers, always happy to help out new brewers. We hope this brief list of gift ideas helps to spark something for you this gift-giving season. Remember to support your local brewery, keeping jobs in our region. Please leave your favourite beer-related gift ideas in the comments! 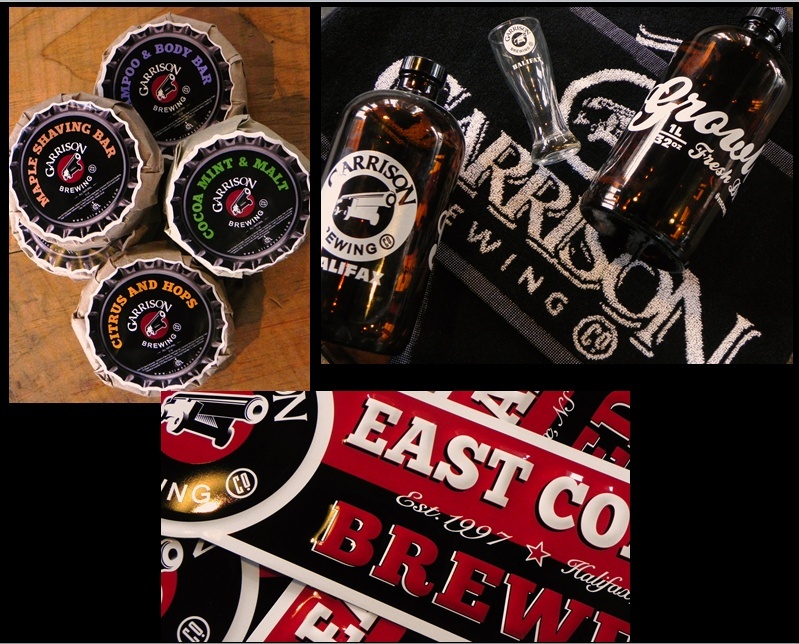 ← Friday Wrap-Up – News and New Beers from Grimross, Garrison Brewing, Shiretown Beer, Picaroons, Rogues Roost and Much More!